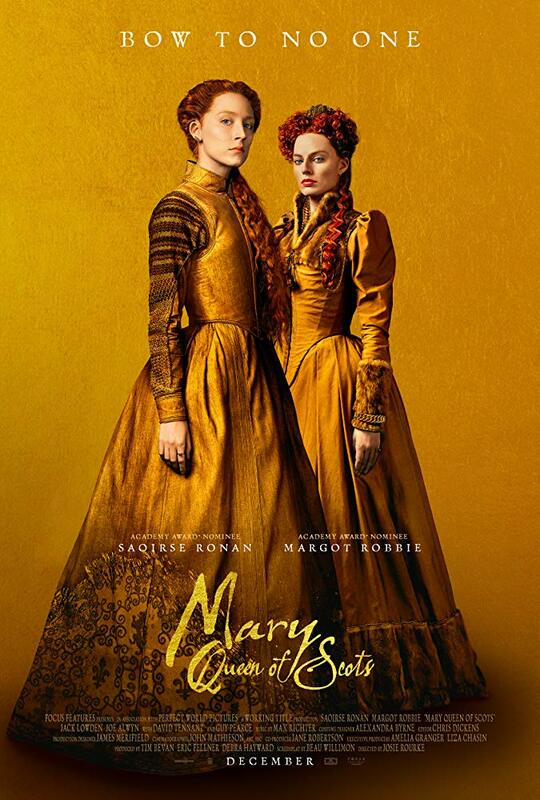 Beautifully shot and even more beautifully acted, Mary Queen of Scots’ grasp is not quite up to its reach as it attempts to wrap up the complex politics of patriarchal rulership, female empowerment and the relationships of the powerful into a single unified theory of tragedy. Sacrificing historical accuracy for the irresistible urge to compare the status of Mary Stuart and Elizabeth I, each contesting in their own way with ruling lands that weren’t ready for them, Mary Queen of Scots is a frequently compelling melodrama. It’s also film which lacks subtlety amongst the drama of manners it covets, frequently turning to its gifted leads to rescue meaning from its plot heavy twists and turns. Not that those twists are entirely free from history. Mary Stuart (Ronan) did indeed return to Scotland after the death of her husband and take up seat to the consternation of the Protestants leery of a Catholic and an Elizabeth I (Robbie) leery of a claimant to her throne. Matching keen political skills to her own vaunting ambition, there may be nothing to stand in Mary’s way except the Protestants who hate her, the British who fear her and her own courtiers who wish she was a man. But if history records the outcome, it’s the reality between the moments which have survived over 600 years which lends itself to drama. In this new telling from playwright and TV writer Beau Willimon (House of Cards) it’s entirely a question of gender and how lack of parity separates not only women from the men around them but from each other as well. Mary is at its most on-point, but least artful, when it plays up the synchronicities between Mary and Elizabeth. Each is faced with corralling a court which doesn’t particularly like them, combating the need to solidify their claim to the throne by providing an heir with their fear that once done they will be cast aside. Each is surrounded by men claiming love, who inevitably turn their eyes to the crowns nearby and a desire to be king in their own right. Each faces a world which wants to treat them as property and not people. Elizabeth, cold and distant, refusing marriage or family or any the elements she may personally want, thrives. Mary, following her heart and frequently her passions, risks destruction at every turn. However trite it can be in action, it’s incredibly fertile ground for its lead actresses. If Mary Queen of Scots is anything, it’s a showcase for Ronan. To one extent or another everyone is working in her shadow. In her hands, and under acclaimed theater director Josie Rourke’s careful eye, Mary is a vast complexity who contains multitudes. She’s cool, calm and collected, farseeing and with a keen political sense. She’s also fiery and impulsive, both in her attacks on enemies and willingness to forgive and work with them. And as doubtful as she can be of the men around her, she still wants to love and be loved … and is capable of fooling and being fooled. Needless to say, Ronan makes a meal of the role, casting her shadow over everyone around her. No one, not even Robbie (disguised behind pancake makeup and severe mannerisms), is capable of escaping from it. Everyone is left to float along in her wake. Even Rourke eventually gives up on more and merely creates the best stage for her star to take over and captivate. As stages go, it’s a beauty. Rourke takes advantage of the Scotland’s natural landscapes and all the English countryside has to offer, throwing a team of Oscar winning artisans at it and a willingness to ignore classic rules of period drama and cast for the modern world. The sole battle scene of the film does not live up to the sturm und drang preceding it, but any director who can keep attention on what is essentially multiple scenes of political meetings (the odd murder not withstanding) should not be underestimated. Sure, Mary Queen of Scots is less than the sum of its parts. Its desire to both say something about the world of its character and the world of today is a disparity not easily bridged and the film never quite makes it. But if all that can be said of it is that creates a stage for Ronan and Robbie to bestride and conquer, that’s just about worth the price of admission on its own.